You can grow a papaya tree from the seed in any time of a year. But in the winter season the germination process takes too long, as well as it gets rotten most of the time. So, seed sowing and sprout planting process start before the winter. And it took 6-10 months to produce fruits. 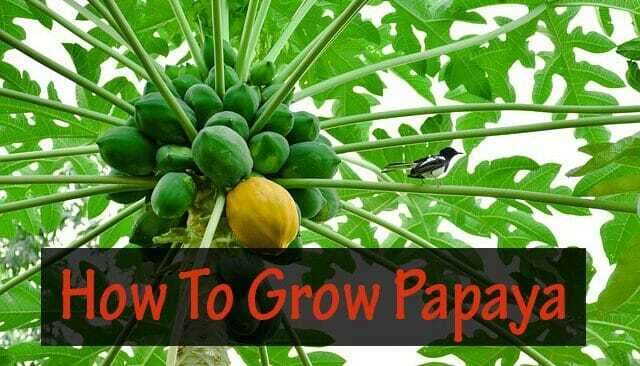 Let’s learn about the steps to grow papaya. Papaya Farming Season: When is Papaya Fruit in Season? This is the best method of cultivating papaya as a commercial or non-commercial purpose. As you know that, papaya is very demandable as vegetables and fruits. Generally, farmers sell 70-80% of them as a row vegetable and other 20-30% as fruits. The organic farming procedure is slightly different from other farming methods. We will cover organic and modern farming methods here. Here, I have discussed the seed planting method, care, and fertilizer application. Applying fertilizer for this fruits tree is somewhat different from other fruit farming. Read through this beginner guide to learn everything I have gathered over time. Before, describing the papaya farming procedure. Let’s learn little more about them. Papaya is one of the most widely used fruits. The papaya tree is very large, and it is decorated in the upper part of the stem in the spiral form. The plants are about three to seven feet in length. Basically, it originates from the southern parts of Mexico and the Central, Northern parts of South America. Now, the papaya is cultivated in the maximum tropical countries. Thailand is not only famous for beautiful villas on the beach in YourKohSamuiVillas. Papaya is cultivated on huge plots in remote villages, on Thailand. And it is one of the most growing vegetables now. Raw papaya is a beneficial vegetable. And ripe fruits are very tasty and nutritious. The raw vegetables contain a type of “Papine”, which increases digestion and refreshes the liver. Ripe fruits contain plenty of vitamins A, B, C and calcium, iron and other nutrients. Raw fruits contain plenty of healthy ingredients. That works on curing untreated, worm infections, ulcers, skin lesions, kidneys, and cancer. 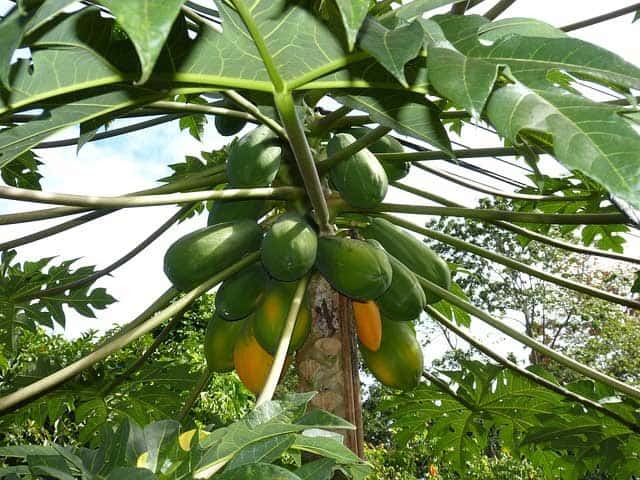 Now, learn the soil and weather requirements for profitable small-scale papaya farm. Papaya cultivation is very profitable among short-term crops in the USA, India, Nigeria, Indonesia, Brazil, and Mexico etc. Those are top grower countries in the world right now. Actually, papaya farming is popular all over the world. High loamy and clay loamy soil, suitable for drainage, is most suitable for this cultivation. This tree does not like cold and wet soil. To avoid root rot make sure that the planting area and soil has a good drainage system. In order to get the most out of a tree, apply mix organic compost, hay and soil in a ratio of 30:10:60. Tropical plants like this require hot, steady warmth during the whole crop cycle. Both the air and soil temperatures can determine the success or decline of the plant and its fruit production. Before you plant a tree, you should know your area’s temperatures and how they can affect papaya farming. 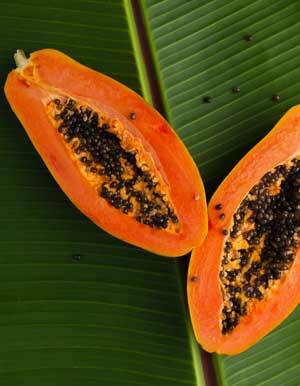 The best places to grow papaya in the U.S. in zones 10 and 11. When the seed germinates properly and when to plant seedling into your garden? There are a lot of popular varieties which can be planted in any time in a year. For this reason, papaya farming has no season dependency. you can saw seed any time of a year. However, in the cold weather season, most of the plant did not grow much. It takes forever. Unless you have chosen the seeds that are specially engineered for the cold area. Generally, it takes 9 months to harvest and later you will harvest the fruits every week. In my experience, I have found that the papaya will get taster and sweeter throughout dry seasons. Oppositely, during the wet period i.e. rain / snowy season, the zest is less sugary. This results because within the wet period the fruits will hold more moisture in the grains. In case of germinating seedling from the seed, This season is mostly dependent on varieties. Normally, it is planted in the month of February to March. Because the successful sprout of a seed is highly dependent on the temperatures. Note #1 – Rain/ monsoon reason: In the heavy rain affected areas, like India, Pakistan, Bangladesh etc. The seed plantation starts before the monsoon area. Note #2 – Snow/ cold weather area: Snow will destroy the plants. Try to avoid this weather or cultivate them in a pot. Which allow you to move this plant indoor in bad situations. How to find the best varieties for your garden and decide which one is better for your garden? To be honest with you I do not know about too many varieties. So I can’t suggest you exactly which one you should grow, besides depending on your location I can be wrong. So for better help, you have to contact local or govt. agriculture help center. However, these fruits have many well-reputed kinds. They are well known for its greater productivity and test. 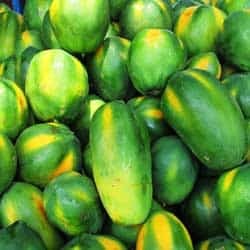 Hawaiian, Rainbow papaya, Shahi papaya, Ranchi, Washington, Honeydew, Bluestem, Kakadam, silo etc. First, you have to prepare the soil in a pot with 10-12 cm height. Use a mixture of dry organic compost, hay, and soil to feel the pot. Then, Plant seed according to any planting method of the square, rectangular or spraying rows. And 10-15 centimeters of distance between two trees in a row. Water moderately, using the hand. 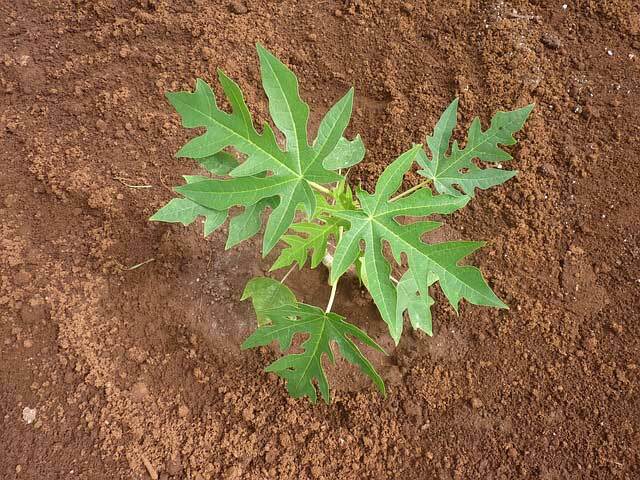 Auspicious time to plant a papaya sapling is in the month after the winter or rainy season. The planting season of this tree at this time is not long. Due to this, these trees are likely to break in the storm. Let’s learn how and when to plant them. Generally, it is better to plant 10 cm long seedlings of 40-50 days old. The rate of death increases after planting is more if the age of the plant less than the recommended time. Plant 2 or 3 seedlings in a 15cm deep hole. The minimum distance between two holes in a garden is at least 6 meter. During planting, it should keep in mind that all the roots are in the soil. At the time of planting, it is better to cut 1 or 2 large leaves in the bottom of the plant. It reduces chances of the sapling. And irrigate the ground/ pot with normal edible water. Besides, it will require shade on hot sunny days. If you buy plants from a nursery. It will be in a polybag. One should slip the polybag with a blade while releasing the seedlings from the polybag. It does not let the soil of the clay does not break or the damage to the plant roots. The target should be placed in the bigger hole than the size of the clay ball in the polybag. Never give more soil to the bottom of the straw. Or do not put extra soil at the top of the hole. It may cause sore-throated diseases. At the beginning of the straw. During the first 1 to 2 days no watering. However, you can sprinkle water lightly with hands on the leaves. An Inspirational Example: A friend of mine, planted seedling in the month of October. It does not increase for the next four months due to winter. During this time the leaves of the trees fell. He does not lose hope, apply fertilizer and irrigated some hot weather, while the papaya tree is small and weak at the same time. But 30% of his plants died in that bad weather. But due to the care of the tree, some leaves on the small trees were there. From a papaya tree, you can yield fruits for 3-4 years. Besides, depending on species it will fruit one or two times a year. So, if you want to reuse the land intercropping is a great opportunity. Needless to say that, there is a limitation when choosing other crops. During the winter, you can grow spinach, red spinach, pulse spinach, coriander leaves, lettuce, pepper in the garden. However, it is better not to cultivate tomato, brinjal and copper vegetables. These vegetables are more susceptible to insect pests. The papaya tree will be in a risk with the poisonous insects. These plants do not need much care. But lack of care and food can affect the profit of papaya farming business. If it happens, the number of the fruits of a tree may reduce. As well as the fruits do not get bigger, also it is common that fruits fall in young age. In a small garden, it is very important. As they directly affect the earnings. When the flower comes in the tree, then one tree or two-legged tree should be left in the remaining two trees in each of the three trees planted in every hole. But, for the benefit of “pollination” or ” pollen mentation”, there should be one male tree for every 10 women plants. There is three stage when this plant will need extra foods. This is not essential in papaya farming. If the soil has mixed with organic compost. Before transplanting the seedlings, fill the hole by, 30-50 grams of cow dung, 250 grams of TSP and 150 grams of MP fertilizer in every hole. After applying fertilizer to the soil, it is better to plant saplings. And water after 10-15 days of applying fertilizer. After one month of planting, this the active growth stage. I will suggest applying Nitrogen to ensure faster growth. Before that perform a soil test. And after seeing the fruits, in this stage, Phosphorus and Potassium are much-needed food for faster-growing fruits and flower. It will boost the fruit size. Weeding process is easy. Remove weeds and unwanted plants near the tree. When should you perform weeding? Before applying fertilizers, remove the weeds from the soil at the base of the plant in small areas. Irrigation of water during drought (a prolonged period of abnormally low rainfall) increases the yield of papaya. In the winter, after eight to ten days in winter and after six to eight days in the summer it is necessary to irrigate water. • Irrigate water in the middle of the two rows so that the water reaches to the root. • But do not let the roots drown in the water. • Trees cannot bear standing water. So, always after giving irrigation, make sure that it drains well. The papaya seedling planted before winter can usually be harvested in 4 to 5 months of planting as a vegetable and as ripe fruit can be collected in 6 to 7 months. When the fruits are mature, it becomes bigger. The farmers harvest them using the hand. The price of this fruits is much higher also the risk is higher. Because, if all fruits may ripe together. The farmers may face difficulties to preserve and sell all fruits to gather. To solve this unexpected situation you can either sell them just before they get ripe. Or, letting selected one to seasoned or ripped. Here is some advanced tip for you. Cut the unhealthy fruits as vegetables. Do not preserve more than 6 fruits in a tree for further maturity. Means let only 6 fruits to ripe in a tree. 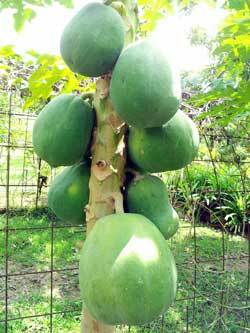 However, a mature green papaya also ripe after cutting of the tree. If the skin of a fruit shows one or more yellow stripes, it means it will ripen in a few days. Cut them off and store in a cool place. Though, once a year this plant should be pruned. Unless it will decrease the outcome, meaning that the fruit can be diluted and thin. Thanks for sharing your knowledge. How to contact you ? Pls share your mail id. I want to start farming in Balasore, Odisha. Its a coastal district, so the weather is humid. I am planning to dig few ponds for fish farming with chicken on the top to utilize the space. I want to do vegetable farming to utilize the water from the fish pond & I want to do goat farming as well, with 50 does & 2 bucks. I want your help in this. I am Planting ginger with papaya. Is it good or bad? No! you can grow them to gather. Hey, I am for the first time here. I came across this board and I find It really useful & it helped me out much. I hope to give something back and help others as you aided me.